How do I remove red wine bottle ring stain from a marble countertop? Well... you likely have two different problems...... marble staining and etching. These problems can occur at the same time in the same spot, however, each requires a separate solution. Marble etching (dull spot) is most noticeable on polished marble, so if your marble is honed you may not notice it as much, but chances are there will be a light ring visible after you remove the red wine stain. Marble is reactive to acidic foods and drinks like red wine. Contact with acids will etch (corrode) the marble causing the dull spots, bottle or cup rings. A marble stain develops when the wine or any liquid absorbs into the stone creating a dark spot. What likely happened is that the red wine first etched the marble, which damages the surface, exposing more porous raw marble making it more absorbent. Problem #1: Etching has physically damaged your marble removing the shiny (or smooth honed) surface layer. This has nothing to do with sealing (in case you are wondering). Sealing won't prevent this. Problem #2: The wine has stained the marble. 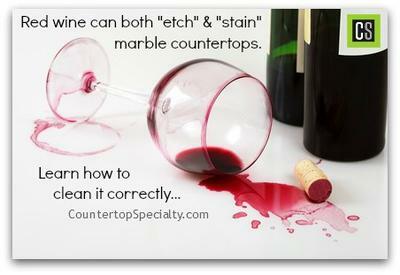 Again, a marble stain results when wine or other substance absorbs into the stone. Sealing can prevent stains. You'll need to get the wine stain out first before addressing the marble etching. I'm sure you've realized by now that spraying and scrubbing with a cleaner will not work. Removing stains in marble requires a particular procedure that is dictated by what substance caused the stain (see guide below). The method for restoring etch marks depends on the type of finish on the stone... honed or polished. On a polished marble countertop this Etch Remover / Marble Polishing product is tops. For a honed surface you'll have to follow a special DIY method. There's no product to restore etched marble to a "honed" finish. You'll find complete step-by-step instructions regarding both issues.... how to repair marble etching and staining correctly in our Cleaning Marble Secrets Guide. This guide will help you a lot now and in the future since you have marble countertops in the kitchen. Typically marble is not recommended for kitchen countertops... it's just too easy to damage and creates tiresome maintenance issues. I hate to say it, but it's highly likely that you will have similar problems (particularly etching) in the future. Kitchen countertops just get too much traffic and abuse to completely prevent it with marble. The guide covers everything you need to know to prevent problems, protect, clean and maintain marble along with practical, proven solutions to any marble repair problem you may encounter. Appreciate your input and the info... sounds like a winner for removing fabric stains. People often believe that tricks and techniques for removing stains is the same no matter where the stain is. In fact, it depends on the type of material that has been stained. Stains in marble are a completely different breed than stains in clothes or carpets. While you can use various chemicals and water to rinse or wash out stains from fabric, it won't work with marble. Once a substance is absorbed into the marble, it is below the surface and no amount of scrubbing, rubbing or rinsing is going to remove it no matter what chemical you use. There's a special procedure required for cleaning marble stains that varies depending on what type of substance has done the staining. I wish it were so simple as washing with a new super-chemical. The one and only way you will ever remove an embedded stain from marble is detailed in the Removing Stains Guide. I'd use Stain Rx and rinse it all off when done. The University of California - Davis (Dr. Andrew Waterhouse & Natalie Ramirez) did a study a few summers ago on getting out red wine stains. Erado-Sol (a.k.a. Stain Rx) beat Wine Out, Wine Away, salt, Sauvignon Blanc, Spray 'n Wash and other remedies on cotton, nylon, silk and polyester/cotton blend. It was the best ready to use product in their testing. Beside red wine, it also removes: fruit punch, beets, gravy, tomato sauce, vanilla extract, berries, iodine, blood, Betadine, Hibiclens, cranberry juice, mascara, coffee, tea, grass, dirt ... just by adding a small amount Stain Rx to the stain, massaging the stain and laundering. Stains such as, grape juice, balsamic vinegar, lipstick and yellow mustard come out by adding a small amount Stain Rx to the stain, massaging the stain, rinsing and then soaking the stain in a bit of Stain Rx for up to 1 hour and then laundering. 1. Ages of red wine stains: 5 minutes, 4 hours and 24 hours. 2. Materials stained (4 samples): 100% cotton fabric, 65% cotton / 35% polyester blend fabric, 57% cotton / 43% polyester blend upholstery fabric and Olefin carpet.